“Mace’s Pharmacies has worked hard for 18 years to stay on the cutting edge of pharmacy to provide its patients the best care possible”, says Rich Mace. “We take pride in knowing we are providing top-notch care in our community” Mace’s Pharmacies are located at 204 South Crim Avenue in Belington, telephone 823-1001 and at 440 South Main Street in Philippi, telephone 457-4233. Mace’s Pharmacies provide prescription and non-prescription medications to patients, and specialize in convenience packaging featuring tear-off bags with the medication a patient is prescribed to take on a specific date and time. Mace’s also features a Medication Sync Program which allows patients to fill the majority of their medications on the same day of each month. “The patients of Mace’s Pharmacies don’t have to telephone an 800 number to speak to someone who does not know them and hope that their medication shows up in their mail box. Our pharmacists are readily available and know who each of their patients are,” Mace says. “Maces caters to special needs and preferences, including medication flavoring, easy-open or child-resistant bottle caps, pill organization, pill-swallowing techniques, flu and shingles vaccinations, Medicare Part D insurance comparisons, on-line and mobile apps, and much more,” he says. Both locations offer emergency after-hours service and home delivery. Holliday holds a B. S. Degree in Exercise Physiology and Athletic Training from West Virginia University where he earned a post-graduate degree in 1994. 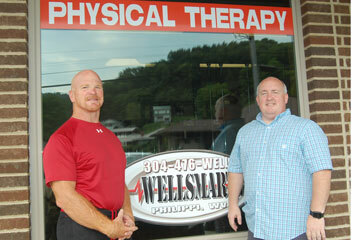 He is a licensed physical therapist, certified athletic trainer, and certified strength and conditioning specialist. He was a member of the U. S. Army and West Virginia Army National Guard for 17 years, and a member of the U. S. Naval Reserve from 1996-2002.